In 1520, Pope Leo X issued the bull Exsurge Domine that condemned Luther’s Protestant views as heretical. A year later, at the Diet of Worms, on 17th April 1521, Luther was summoned to either renounce or reaffirm his views. After much thought he stood firm, saying: ‘Unless I am convinced by proofs from Scriptures or by plain and clear reasons and arguments, I can and will not retract, for it is neither safe nor wise to do anything against conscience. Here I stand. I can do no other. God help me. Amen.’ On 25th May, Luther was officially an outlaw. 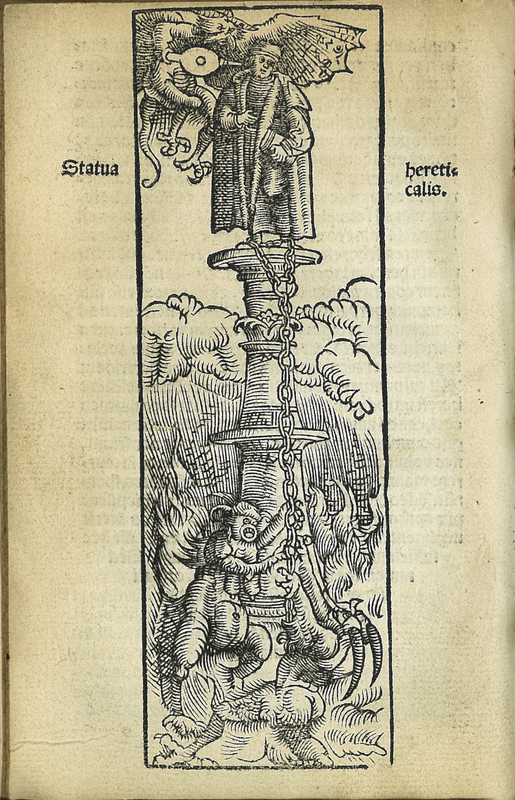 Here is Bernard of Luxemburg’s popular Catalogue of Heretics that shows Luther on top of a ‘column of heresy’. Catholic iconography is evident: a demon blows ideas into Luther’s ear with a bellows; another drags him with a chain into the flames of hell. [Bernard of Luxemburg], “Catalogus Hereticoru[m],” ourheritage.ac.nz | OUR Heritage, accessed April 20, 2019, http://ourheritage.ac.nz/items/show/10343.